Agricultural Economic Insights Does the Natural Hedge Work? Does the Natural Hedge Work? In last week’s post we used USDA yield estimates to look at how revenue expectations have changed as commodity prices deteriorated. This led us to wonder about the ‘natural hedge’ and its effectiveness; how strong the natural hedge is and how much variability is there across the country. Economists often talk of a natural hedge occurring when low yields are offset by higher commodity prices, and high yields are offset by lower commodity prices. In theory, this condition naturally adjusts revenue as yields and prices move in opposite directions, serving as an automatic risk management tool. In this week’s post, we examine historical county-level yield and state-level market year average (MYA) prices to better understand the natural hedge. 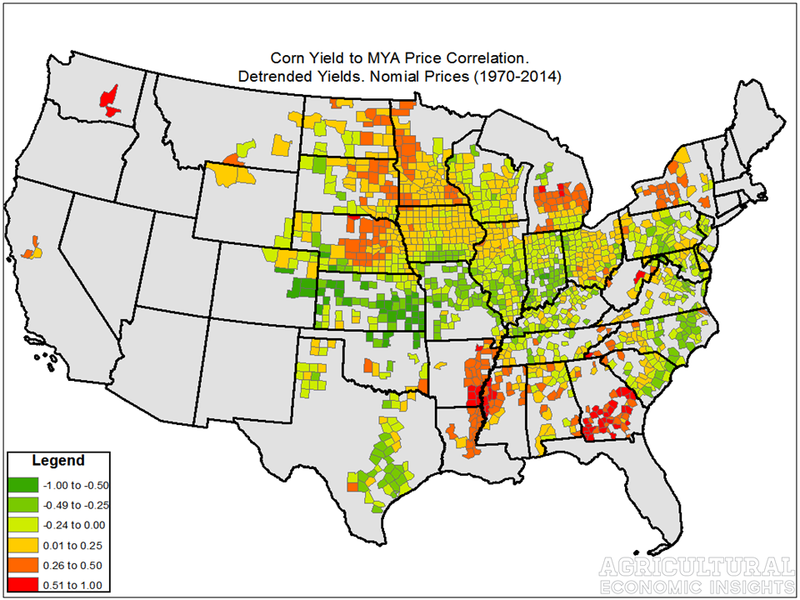 To measure the price/yield relationship of the natural hedge, the correlation between county-level yields and state MYA prices from 2000 to 2014 was calculated. Shown in figure 1, the natural hedge was most effective in regions of the country in shades of green, where the correlations were the most negative. Negative correlations mean that as yields went up, state MYA prices were generally lower and vice versa. The negative correlations of the natural hedge were most prevalent in the Southern Plains and heart of the Corn Belt. Shaded in yellows and reds are regions where the price/yield correlations of the natural hedge were least effective (the correlations were positive). Positive correlations arise when prices and yields tend to move in the same direction. In other words, these are areas where higher yields tended to occur when MYA prices were high, or when lower yields tended to occur with lower MYA prices. In general, the natural hedge was least effective in the Northern Plains and in the South. Along the Mississippi River, for instance, the correlation were very positive and the natural hedge conditions were extremely weak. The relatively strong negative correlation between yields and prices in the heart of the Corn Belt is not surprising. This area of the country is produces a significant amount of the corn crop. The correlation data bear this out, when the central corn belt produces a large crop prices tend to be lower, and vice versa. Within the Corn Belt the correlations weaken as one moves into northern regions such as Northern Iowa, Northern Illinois, Minnesota, and most of Nebraska. Ohio also tends to have a weaker price/yield correlation. Figure 1. Correlation between Yields and State Market Year Average (MYA) Prices for Corn. 2000 – 2014. Data Source: USDA’s NASS. The natural hedge correlations for soybeans from 2000-2014 are shown in figure 2. The most striking observation is how, in general, the yellow and red shades are more prevalent when compared to figure 1. This would imply that the natural hedge is weaker for soybeans than corn. When considering soybeans more closely, Central Kansas, Northwest Missouri, and Southern Indiana appear to be the regions where the natural hedge correlations have been most negative in recent years. Similar to the conditions in corn (figure 1), the natural hedge correlations tended to be positive in the Northern Plains, Michigan, and along the Mississippi Delta. Figure 2. 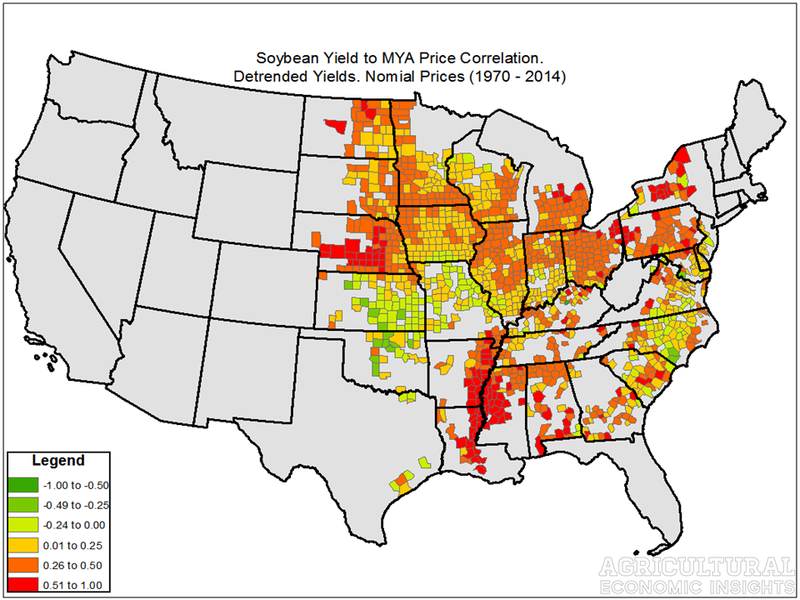 Correlation between Yields and State Market Year Average (MYA) Prices for Soybean. 2000 – 2014. Data Source: USDA’s NASS. While this evaluation of the natural hedge focused on correlations and did not evaluate the magnitude of changes in revenue, it’s clear that the relationship between yields and prices vary by region and crop. Overall the natural hedge seemed to be more effective for corn, where correlations were more negative, than for soybeans. Geographically, the Southern and extreme Northern Regions were less effective. The analysis here points to the case where correlations are sometimes, but not always even negative in many regions of the country. This likely means that one should not expect that yield increases will make up for declines in prices. Our last post looked at revenues and came to a very similar conclusion for the current growing season. There were only a few states that where it appeared that the yield increases would be enough to offset price declines. Interested in learning more? Follow the Agricultural Economic Insights’ Blog by clicking here. Also, follow AEI on Twitter and Facebook.